The red line is the border between Berlin and Brandenberg; it also marks the location of the former Berlin Wall and borders in the water as well. Due to West Berlin being in the middle of East Germany, former West Berlin is the east side of this map; to the west of it is former East Germany. Having talked with Anne about making a visit to Glienicke Brücke since before the Unity Day race last October, we finally managed to do so last Thursday. We made a tour of it together, sprinkling in a few other sites from that portion of the Wannsee along the way. I discovered, not surprisingly, that I’ve already been enjoying the best view of the duo-toned bridge for months from the optimal vantage point: the water. As part of our outing, Anne showed me the small neighborhood where her parents moved a few years ago. They live on Wannsee Island in what is called the enklave, a piece of the east carved out of the west that was once tucked behind the Berlin Wall—walled in, cut off from the rest of the surrounding area, how inconvenient, I’d thought. Yet over dinner the next night our German friend Jan pointed out that people who lived in such walled-off places felt special—they saw themselves as walling other people out; how exclusive it must have felt to be inside! I’d always looked at it as a situation of the Soviets trying to keep East Berliners from making a break to the more attractive, democratic, free west, but obviously there’s another perspective from the other side of the wall that I hadn’t considered. Her parents live quite close to where we often turn around our boats in the Kleiner Glienicke, nearly at Glienicke Brücke but not quite; it’s where the border once cut across the water, and western rowers were not allowed to pass any further. This holdover from former times remains a common turnaround point for the club today. Anne showed me from land where we row, and asked if I could tell where we were. “Is Glienecke Brücke over there?” I asked, but it was not; I’d confused my directions. A few seconds later the orientation righted itself in my mind; shifting my perspective from water to land, from rowing backwards to standing on terra firma looking forwards, it all clicked into place, “No, wait! It’s over there,” I pointed the other way, “and we usually come from this direction,” I said, pointing left, stating the obvious, but delighted to know, truly know where I was. We walked across a small bridge we’ve rowed under a few times to reach the Babelsberg Schloss, and there I saw that over the years the trees had been trimmed just so to provide optimal views of the water from the castle. From the waterline it’s the path that stands out along the shore, and trees and gardens climbing up the hill, but from up on high the view was majestic; you could imagine the Kaiser on horseback, surveying the land and seas under his rule. After a stop at the Glienecke Schloss café, Anne dropped me off at the boathouse. There I met up with Jörg and Frank, with whom I had a plan to row singles, another long-deferred plan coming to fruition. The USA-Germany World Cup game started as we launched that evening, and we could hear the sounds of the game on a large-screen TV mounted on a neighboring patio. With the game on, Berliners were glued to the TV, and the lake was blessedly empty, remarkable because the water was flat as glass and the sun was still high and the late June day would offer light until 9:30 p.m.—perfect conditions for an evening row. The water was all ours. Frank stayed with us for a bit but peeled off at some point, needing to get back in time for another engagement. Jörg and I continued on. From the water we could hear cheering from cafés I didn’t know existed, tucked behind the trees, and I knew Germany won from the cheering and honking of horns, though I thought the score was higher than the 1-0 it turned out to be. S later told me that from where she watched the game at Brandenberg Gate with her friends, the Germans around her cheered loudly every time the US team fumbled, so maybe that’s what the patrons at the Wannsee area cafés did as well, making it seem Germany scored repeatedly, from our vantage point on the water anyway. When we rested near Glienicke Brücke, Jörg mentioned that you can row to the historic town center of Potsdam from there. We were already doing an umfahrt (round trip); what was a few more kilometers? The water being like glass, and this being my last row on the Wannsee, I agreed to add to what I’d thought was already the longest row we could make. We passed the new theater that looks like a clamshell, set on the edge of the water, and we took the Alte Fahrt, the old way, a narrow canal where no motors are allowed, and rowed past a beer garden in full swing after the game, and a handful of fisherman sitting on the banks with their lines in the water, until the greenery gave way to a more urban setting and opened onto a spectacular view of the cathedral dome and the newly restored red City Palace of Potsdam. We began the return trip of what would turn out to be a 25 km. row, past Pfaueninsel where we could hear the eerie peacocks cawing, sounding like crying cats, I later told my girls. The Grosser Wannsee was in the calmest state I’d ever seen it. Jörg pointed out the distant Teufelsberg at my request, a place I’ve wanted to visit but haven’t managed. Teufelsberg (Devil’s Mountain) is a manmade mountain made of 98 million cubic yards of debris that was cleared after World War II. In the 20 years following the war, the unusable building debris was carted here in countless truckloads, then covered with soil; it is now covered with trees and paths; ensconced as it is in the Grunewald Forest. On top of the mountain sits the now-abandoned US listening station, one of the largest of the National Security Agency. The white towers are still visible from the middle of the Wannsee lake. Spies from the Cold War, atop a mountain of war debris, heaped on the site of an unfinished Nazi military college. It comes as no surprise that the city doesn’t know what to do with the site nowadays; apparently the spy station is covered with graffiti and attracts vandals and is closed to the public. The sun was finally setting after our three-hour tour as we headed toward shore, tinting the sky red. As we crossed the widest stretch of the Grosse Wannsee Jörg was the only living thing I could see—and that was only if I craned my neck to pick him out in the dying light. He charted a direct course for the distant dock of our club, so I followed his path. Looking to the stern was the most serene sight imaginable; all I could see before me were the pairs of my swirls, strudel in German, pinging away from me like fading footsteps on the otherwise flat Wannsee, the sun glowing red over the distant hills, guiding me home. It is an image I will recall for years to come. 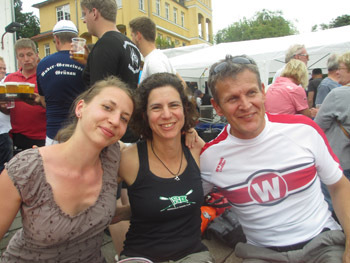 Saturday was the Müggelsee regatta, ending my time in Germany with rowers and a race and party, in just the same manner I’d said goodbye to Minneapolis rowers at and after the NWIRA regatta at Lake Elmo last August. Everything is heightened when a departure is imminent, and it being my birthday weekend only added to the selfish sense that all this had been arranged for me, reinforced when my boatmates presented me with a silver oarlock pendant as a going-away gift. Dancing started to a DJ and later a live band; human boats formed on the ground, complete with coxswain, legs interlocked, to some “Oh Ja” song I did not know, and there was earnest dancing to “Moscow, Moscow,” a pop song that is beloved in former East Berlin, I learned, which is where the race and party was held—and embraced by the locals without irony. It was Berlin in a nutshell, why it’s an endlessly fascinating city to me—that what may strike me as oppressive—Soviet rule—and ridiculous—walling off half a city for decades—can be celebrated today by festive young people. But as Jan reminded me: people our age were born into a walled city. They lived half their lives this way. It was normal. They have internalized the contradictions long ago, I suppose; I’m the one who hasn’t. Echoes of times before the Cold War still lie within. I will never forget an image Anne shared with me, an excerpt from her mother’s memory. After her parents’ wedding, her grandmother spent the night in the same house as the bride and groom. In the middle of the night there was a thunderstorm. The young bride went to check on her mother and found her sitting fully dressed, bolt upright, her suitcase packed and at her side. She’d obeyed what her mind took as the sounds of bombing, the old fears and instincts kicking in; she was waiting for the call to leave for the safety of a bunker, 30 years after the fact. The fears of the old ones, the burden of their children and grandchildren; there are myriad invisible ways that 20th century Germany continues to shape the people living here today. There is so much history rattling around in their collective psyche, molding the way they live their lives, adding a sheen of humility to them all. I will go home more curious than ever about Berlin and its people. The more I learn about Berlin, the less I seem to know, that old cliché ringing true here; I could spend the rest of my days here exploring, talking to people, trying to understand these conflicted layers that haunt and inhabit Berliners. I had felt the same when we left St. Paul last summer, that there could be no end to things to discover and try in the Twin Cities, places to go, see, experience, taste, visit in other seasons; people to get to know, races to pursue—always, always more. To miss a year of it felt unfair. Being apart from St. Paul made me see how much I want to be from somewhere; having grown up in both Boston and Philadelphia, I can claim neither as home. At this point in my life, I’d like to know where home is. But Margaret Gellhorn, war correspondent and author of Travels with Myself and Another (the “other” being her husband Ernest Hemingway) says she eventually bought homes in 13 countries, so enamored would she become of the places she traveled. She made it acceptable to me to leave one’s heart scattered across the world, not just anywhere, but in those places where you connect with people, establish some kinship to them or the land. And for once I feel that I have a home now in a new place. I won’t buy a chunk of real estate like Gellhorn, that’s neither the Berlin nor the Mazullo way, but I know I’ll be back. You would not have heard me say that just a few short months ago. I’d been pitting St. Paul against Berlin, pining for one while living in the other; I did not see how I could hold them both close. But with time I’ve come to see that it’s not either/or, but both/and—the elements are the same, here, there, anywhere: just do the things you love, find the sun to orient you, and make a friend who will guide you home; the city, the continent, the language matter not a bit. But the land, the stories, the people: they matter more than I can say. This entry was posted in History and culture, Rowing and tagged Berlin, Müggelsee, regatta, Rowing, Wannsee on July 1, 2014 by Jill M..